A Wrinkle in Time. Just hearing the title takes me back to those late elementary school days. I remember spending a solid two weeks reading everything I could get my hands on sometime during my fourth grade year because our teacher had come up with the brilliant idea of letting us earn homework passes for reading. All you had to do was read a book and tell her what you'd read at school the next day. She'd put it all on a big chart for everyone to see, and after you got up to so many books (ten maybe? ), you were given a pass to use in place of actually doing your homework! (This would be really helpful in grad school actually.) Though I didn't have a lot of books at home, my neighbor did. Picture books and chapter books and those early reader ones. I sat on the floor of her apartment and read probably fifteen books the first day. I can still remember the look on my teacher's face when I brought in the long list. Dear Mrs. Christian. She was one of those who secretly, outside of class, must have laughed all the time because smile lines showed around her mouth and eyes even when she wasn't smiling. She had a sparkle in her eye I couldn't understand at the time, but now I know it was a mix of mischievousness and determination. Once on the playground, a boy hit her and ran away from school. We were taken back to our classroom by another teacher and sat terrified wondering what would happen to Michael (yet utterly impressed that he'd run from school grounds without looking back). The entire class held its breath in silence, waiting for Mrs. Christian to return. I was sure she'd have that angry teacher look on her face and punish us the rest of the day for what he'd done, but when she came into the room, hair disheveled and face red, she wore a huge smile. I'm sure there was a collective sigh. "I'm getting too old to run like that," she said, or something similar, and suddenly everything was okay again. That's the kind of teacher Mrs. Christian was. 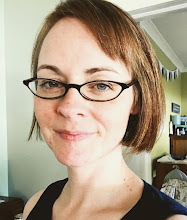 When she saw my long list, she looked at me and said, "Picture books don't count," but her sparkly eyes said, "You cheated, but I'm impressed." Or at least that's what I thought they said. She let me have a homework pass but said I'd have to use books closer to my reading level for it to count the next time. I guess she knew I'd probably read 1000 picture books to get out of work for the rest of the school year if given the chance. Sorry, I meant to talk about A Wrinkle in Time, but that's what seeing one of my old favorites does to me...it's like a wormhole. Suddenly I'm back, and I can see Mrs. Christian's red face and feel my relief that she's smiling instead of angry. "Funniest thing," she said. "Michael saw his dad parked at the grocery store and took off." Another collective sigh mixed with the mystery of coincidence. We must have all thought he'd never be seen again. I did. He'd live on the train tracks and grow a beard. He'd live off of scraps and have a shabby dog for a companion and--oh, but never mind, his dad was just parked across the road, so all was well. 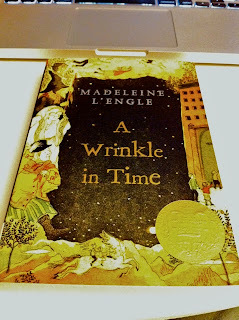 I'm reading A Wrinkle in Time today in order to analyze it for class. That means I find the figurative language, note sentence structure and diction and point of view, look for distinctions in characterization, things like that. I loved the story as a kid because it appealed to my imaginative side, the side that wondered about the universe and what could be and what couldn't be. I remember thinking, could this really happen? Could it be real? Maybe. It could be. Why not? This book was probably my first exposure and response to realistic fantasy (or science fiction depending who's categorizing) and had that very effect on me--to seem real but surely not real at the same time. Lovely. It might sound a little wrong to dissect it like I'm about to do. As if cutting it into smaller parts and then cutting those smaller still will somehow expose it for what it is--just letters formed into words put into groups organized into scenes and placed in chapters until everything seems contrived and nothing seems magical anymore, but no. Analyzation of a brilliant book doesn't work that way. It's more like seeing a beautiful flower and learning how the separate parts work together to make it live and then looking even closer till you can see the very atoms which are themselves tiny worlds of mysterious activity set in motion by an even bigger mystery. The flower doesn't lose its beauty, it becomes epic, unbelievable almost--that everything should work together so that in the end a perfume rises to meet you when you pass by a rose on a bush or a book on a shelf. This post is in memory of childhood and dear Michael, the one who ran away, the one I caught cheating off my test, the one who loved all the girls and was funny and hyper and had a nice smile, to dear Michael who moved to a new state so far away and was later killed in a bicycle accident, suddenly impossibly distant from us in a place none of us knew how to reach. After nearly four years of critique circles, I now have a tiny group of faceless critics living in my head. They sit at a rectangular table and bear swords in the form of pens with red ink (yes with the ink of my blood like when poor Harry learns the cost of telling the truth to a lying, selfish, good-for-nothing witch. No really, she's a witch). Until recently, this critique group in my head was based on a limited understanding of what a story can be. Sadly, I have to take credit for those limitations because the critics live in my brain after all, and the only resources they have available are those I allow into the...brain room (my analogy just got weird). Reading, learning, thinking, and especially questioning what I've always believed to be true--these all affect my tiny critics, broaden their tiny minds. For a while, especially in the beginning before I'd begun to learn and stretch and question, the group was really strict and insisted I fit whatever I write into a formula. According to them, a story just couldn't work unless a+b+c led to the climax which led to the denouement which led to the possibility of a sequel. But guess what--it was all a lie! A lie I uncovered over time by reading really good books with meandering plots. A lie that may have only been embedded in my brain room and not yours, but a lie nonetheless. That's not to say plotting is bad or that a+b+c is bad. It's just to say all writing styles don't fit the formula, nor should they. Just ask Charles Dodgson. Or the faceless army of storytellers through the ages, those mysterious authors of folk and fairy tales and the readers who love them. Just read Swallows and Amazons--nothing happens! Mary Poppins? Episodic and all about grown-ups! The Railway Children? Dream Days? The Wind in the Willows? Countless classics have no inciting conflict to motivate a protagonist to go on a quest! Some with no climax at all! And even better, half of those classics weren't even written for children, but children still read them and love them anyway! There is no perfect formula. There are only good stories. Write backwards. Write forwards. Write inside out, upside down, with pictures, without pictures, with nothing but pictures. Write in three genres at once if you can manage it. Write a true story. Write a false story. Write whatever you want! But there is one rule. In all the classes and all the conferences and all the lectures and panels of academics and panels of publishers and panels of agents and small groups and big groups and award winning speakers and award losing speakers, the ONLY common piece of advice I've heard, the one magic rule to follow in putting the ideas from your head into words and sharing them with the world is this deceptively simple nugget of wisdom which must be followed exactly to the letter whether you've plotted or unplotted, whether you write what you know or don't know, whether you show don't tell or tell don't show, whether you're allegorical or metaphorical or phantasmagorical, the golden rule, the one rule, the Unbreakable Rule is this: Write well.